The Millennium City remained waterlogged on Saturday, around 36 hours after the prolonged downpour that threw life out of gear across the city and its adjoining areas. CUTTACK: The Millennium City remained waterlogged on Saturday, around 36 hours after the prolonged downpour that threw life out of gear across the city and its adjoining areas. Though water has started receding from some parts of the city on Saturday, still at least 53 localities in low-lying areas are reeling under waterlogging. Locals alleged that the Cuttack Municipal Corporation (CMC) officials have failed in clearing the accumulated storm water though more than 200 pump sets have been installed. The existing drainage and sewage systems cannot carry waste water even during the dry months. The question of carrying rainwater does not arise at all, they said. Commissioner of CMC Sarat Chandra Nayak said more dewatering pump sets have been pressed into service in the waterlogged localities. "Waterlogging from the 53 low-lying areas of the city is expected to be cleared by Sunday morning after which we will start necessary disinfecting and sanitation activities," said Nayak. 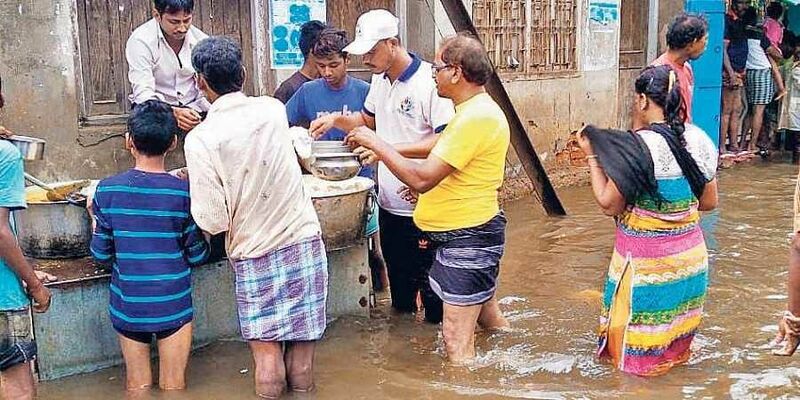 The district administration has also continued its relief operations for the second consecutive day in the worst-affected localities in Cuttack city, Choudwar Municipality and Athagarh block. So far, the administration has distributed 30 quintals of rice, 10 quintals of flattened rice, 85 kg of molasses, 1,100 breads and 900 packets of biscuits besides providing cooked and dry foods to 18,737 affected people.